I am currently in the process of installing new wardrobes into my bedroom and I've been looking around the net for some inspiration. I have a small-medium sized, square bedroom and not a huge amount of space to work with. I had painted my room a few years ago and I still like the design, so I'm really just looking for a few bits and bobs to make my room look more sophisticated. I've always liked the Silver/Grey/White colour scheme for bedrooms, but my room currently have Mauve painted walls and a dark pink and white wall paper covered wall, with dark oak coloured floorboards. So together it would be a bit of a mismatch. The wardrobes that I got are the PAX wardrobes from IKEA, with sliding doors. Initially I wanted mirrored doors, but thinking practically, there's no way in hell I would stay on top of cleaning them! So instead, I got ones with a mix of mirrors and light-stained birch panels - I will try to do a full in-depth post of my wardrobes soon! So now, I am looking for a new desk and a few decorative things for my room. I thought I'd share a few of them with you for inspiration! Click on the pictures to see the source I got it from! I saw this on Pinterest and thought it was a pretty cool idea! They used cork board place mats from Ikea, which cost about £4 for a pack of four, to create a large cork board for the wall. How clever?! I think it looks so effective and it's great if you like to be organised or are studying and need revision notes and deadline reminders to be visible. You could also put pictures of you and your friends or inspiring quotes up on there. The best thing about it is that you can constantly change what you want up there so if you get bored of something you can easily switch it up! Unfortunatley this wouldn't suit the them of my room, but it would be cool to have it by a sideboard in the hallway for the family to use. Lets be honest, I couldn't do a bedroom inspiration post without including an IKEA alex drawer could I?! 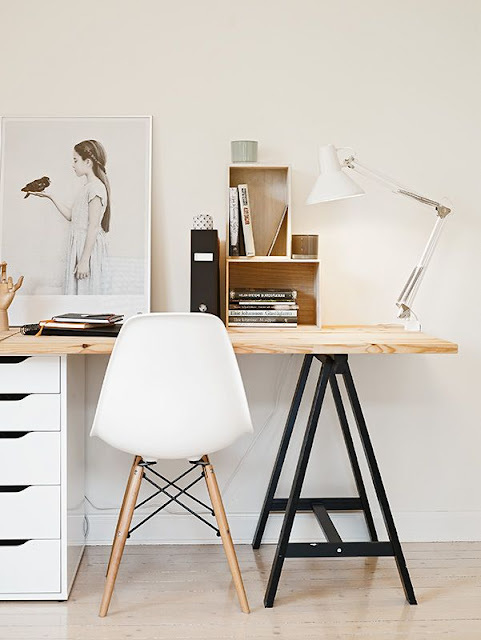 Originally I wanted the malm dresser but the all white colour wouldn't suit my colour scheme. I then wanted to see how I could incorporate the alex drawers as I know they will act great as storage. I saw this picture and I thought it looks really effective. You can buy the Trestle and the table top from IKEA and they're really affordable. The most expensive thing is the Alex drawers which cost around £50. Although they are white and technically don't match my colour scheme, I am looking at ways in which I can perhaps paint them a colour that would match. I think I would get a table top that would match my wardrobes so they do link in together. But I like the Black Trestle a lot! My only concern with the table top is that it is slightly long and may not fit in my room - but hopefully I can make it work. It's the simple things that can look really effective and creative! The picture above is so simple yet looks gorgeous! I bought fairy lights last year to dangle around my room but I didn't like how they looked when they weren't on and they actually looked a bit messy. I'm glad I didn't chuck them away because I really like how they have been used here, of course you need battery operated fairy lights and you need to be able to hide the switch in the middle, but otherwise they look really pretty. Yes, they may still look messy when they are not on but the good thing about it is that you can hide them away in your drawers until you're ready to use them! You could even put them in a thin tall vase and place them by your bed as a floor lamp! 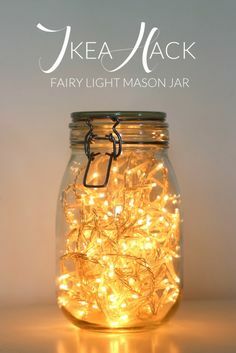 (You may need two sets of fairy lights for that!). I have literally always wanted to have this in my room! I like to travel and there are so many places that I've wanted to go so a world map pin board is perfect! 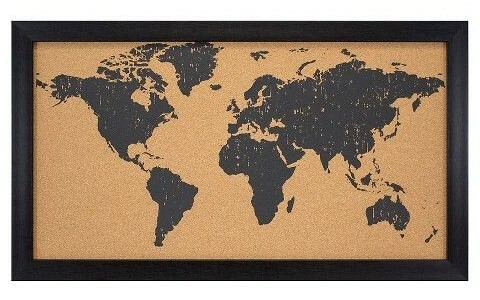 I'm not sure if this is a canvas or a cork board, but I was thinking of getting a world map poster and sticking it on a cork board that I already have. Then all you need are some cute push pins and you're done! You could have two sets of push pins, one for all the places you have been and another for all the places you want to go to! It's also a great way to remind you to put some money away for travelling!! I am so excited to show you the finished result of my room - although it may be a while before I am totally happy with all the decor. I would love to know where you go looking for inspiration for decorating! Disclaimer: None of the above ideas are my own. You can see the original source by clicking on the pictures. This post is purely designed to help inspire you like they had inspired me.